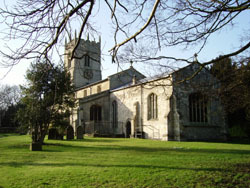 The ancient and beautiful church of All Saints is situated in a prominent position towards the northern end of the village. For the last two years Beckingham has been part of a Benefice of four parishes with sister churches in Walkeringham, Misterton and West Stockwith. All four are the responsibility of the Vicar (Priest in Charge) whose Vicarage and office are located in Misterton. All Saints church holds at least one service every Sunday, at least two per month of which are services of Holy Communion, and there is also a mid week service of Holy Communion. Much importance is placed on meeting the particular needs of young people and families with children and the Benefice employs a licenced lay reader who specialises in promoting this type of ministry both in the four churches and in the village schools. Everyone is welcome to go along and join in the services.